These are also the recommended default Speed Up Settings for Wired Controllers. 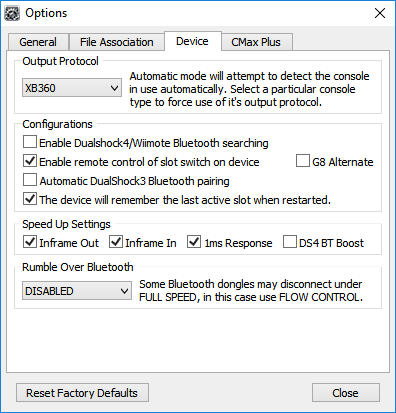 Rumble Over Bluetooth is disabled as it's not being used. 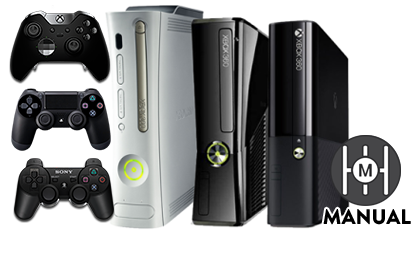 Connect the CronusMAX PLUS into one of your Xbox 360 USB ports via it's Output Port. Connect your Wired Controller of choice into the Input Port of the CronusMAX PLUS. If it's an Xbox One or DualShock 4 Wireless Controller use a full data Micro-USB Cable. If you are using an Xbox One or DualShock 4 Controller with a Micro USB cable and the LED on the CronusMAX PLUS changes back to AU then the Micro USB Cable is probably faulty or not compatible. Try another and make sure it is full data and not just a charging cable.